Over her career, Kyia has directly been involved with 37 new projects across South East Queensland, many of which have received industry recognition as being the best performing projects across the Gold and Tweed Coasts. In 2016, Kyia was nominated for the Telstra Women’s business Awards and was a Queensland finalist out of approximately 5,000 entrants. This year Marketing Projects SEQ has been nominated for the Australian Business Awards in the Business Start-Ups category. After doing her first semester in Bachelor of Business at Southern Cross University after graduating in Year 12, she decided she wanted to pursue her passion in real estate and completed her sales certificate in 2006. Starting out as data entry progressing to receptionist, marketing then sales support at (former) Ray White Palm Beach in her first year, she then moved onto Raptis Group Limited in 2007 in position of Client Liaison then progressed to Contracts Administration, Commercial Sales Support and Project Sales and Marketing. In 2010, Emandar Group had appointed Kyia to look after the project marketing, business development and assisting with sales and contracts administration. Kyia completed her full Queensland Real Estate License during her time with Emandar Group. 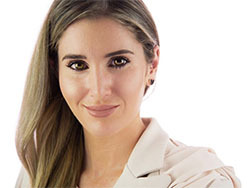 Colliers International appointed Kyia as Project Manager of the Gold Coast developments in 2015 and within 3 months of being with the company she was recognised as being the highest revenue earner in the office and was promoted to Director of Gold Coast Residential. If you would like to have a discussion with Kyia Anderson, please call 1800 749 470 or email kyia@marketingprojects.com.au. I have had dealings in real estate over many years and Kyia Anderson is one of the most knowledgeable, professional and intuitive people working in the industry today. Her depth of knowledge and understanding of the market in South-East Queensland is second to none and she is most definitely the go to person for anyone wanting to make a sound property investment. Kyia’s honesty and ability to provide factual information, without a pressured sales pitch is undoubtedly one of her many strengths. We immediately felt like we had come across the right person for the job!!! Kyia has many strengths – commitment to her clients, honesty, integrity and is very competent in all areas of her profession. Her managerial skills are second to none – her team is a credit to the time and energy she gives them!!! Kyia brings forth her circle of connections she has developed over the years with builders, valuars and brokers. Her dedication and commitment to her clients enables us to expand and go forward knowing and believing we have the right professional backing and support. We were referred to Kyia Anderson by developers and agents she had previous dealings with. upon doing our own independent research and comparing her experience and results achieved against others in the same field in the industry, we felt she was the most suitably qualified person for taking on the Rawcorp developments in a Project Marketing capacity. From the moment we first met Kyia, we felt comfortable with her as a person and in her capability to deliver upon our expectations. Since Kyia and Sophia's team have been appointed to market our developments, we have seen professionalism and attention to detail in all areas of the sales process. They have priced our developments, worked on branding and re-branding our projects, researched, promoted to external networking agents and selling our stock. We have seen results achieved and will be appointing Marketing Projects on our next development of 76 units in the Glades, Robina. We would highly recommend Kyia and her team to anyone requiring project sales and marketing professionals. Kyia is currently working with us (Alder Developments) at Aura Apartments, Varsity Lakes, Qld. Aura is a two stage 120 Apartment development worth $55 million. We were initially impressed with Kyia’s presentation, knowledge and strategies to sell Aura Apartments. Kyia’s professional and results driven approach has been a significant factor in the success of Aura apartments. Kyia excels in sales, marketing, relationship building and development branding. Kyia is genuine, honest and works very hard to ensure the development is a success. I have brought clients to the Emandar Group development on Harbour Quays Drive and Kyia and her team have always been very helpful and a pleasure to work with and as a result, sales have been achieved. I highly recommend Kyia and her work with the Emandar Group. She is friendly to work with and has an extensive knowledge of the product. Kyia has exceptional knowledge and skill marketing projects, is results driven and happy to go the extra mile to ensure her clients get the results they need. This recommendation doesn’t come only from me, it’s the result of feedback I’ve received from clients on a number of occassions.